The arrival of Spring ushers in my deepest desires for a thoroughly cleaned house, inside and out. Shelves and cupboards organized. Base boards and walls washed. Windows that are streak free to let in the sunshine. 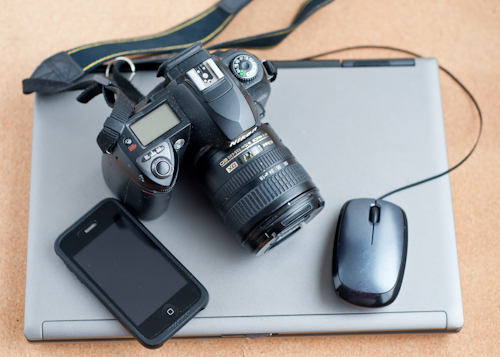 But there are a few items I seem to forget about — the technological devices that I use every single day and might need sprucing up the most. I hold my cell phone and home phone in my hands each day, touching the buttons and screens, holding it to my face. I allow my children, with their sticky little fingers, to play games and send texts to their dad or have a chat with grandma. My laptop screen is smudged by the same tiny fingers. Crumbs lurk between the keys. My camera and lenses shows signs of my last food shoot. Don’t get me started on the desktop computer! I’m not sure I can remember the last time it was properly dusted and wiped down. Then there’s the television with diaper cream stuck in the speakers and even more smudges on the screen. (Or is this just my house?) I’ve read that these devices with their many buttons and screens harbor more germs than the toilet! Ew! So how, and how often, should these things we use daily, these things we can’t seem to be without, be cleaned? No worries. I’m here to help. 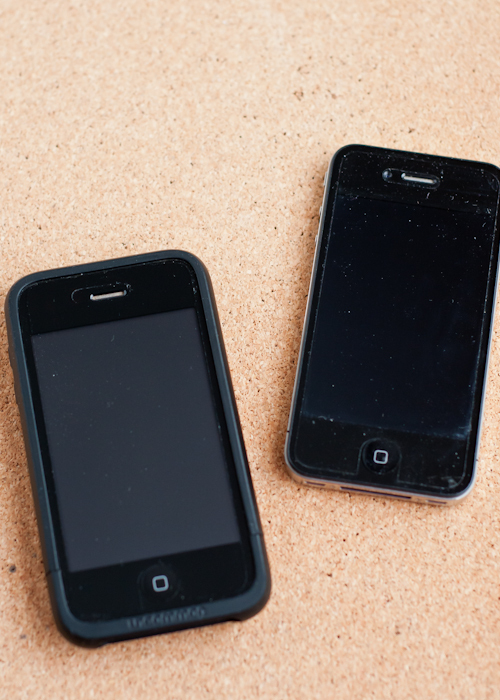 This post will cover the nitty gritty of keeping your technology dusted, clean, and smudge free. Secret #1: Assemble an arsenal of technology cleaning tools. It’s good to keep these cleaning items on hand because you never know when you’re going to drop muffin crumbs onto your keyboard while you’re checking blogs during breakfast. : ) Let’s look at what I have in my kit (clockwise left to right). Screen gel spray, disposable screen wipes, canned air, cotton pads, rubbing alcohol, microfiber cloth, soft brush, tweezers, q-tips, toothpicks, lint-free lens cloth, and screen eraser. Screen Gel Spray is a special alcohol-free cleaner that is specially made to clean screens. 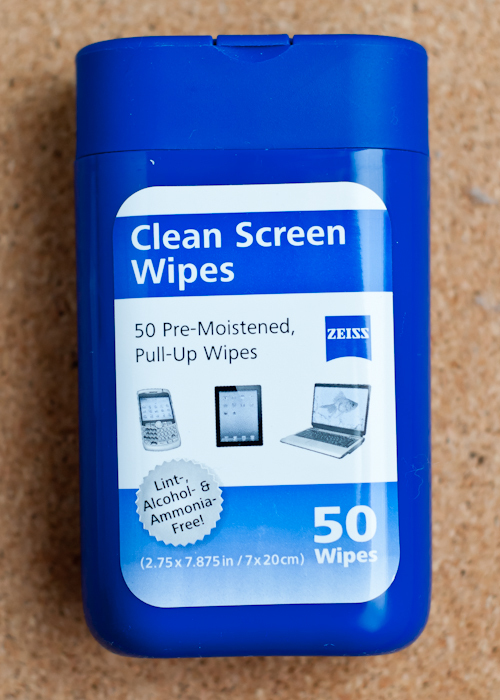 Disposable Screen Wipes are perfect for keeping in your purse for wiping down your cell phone while you’re out and about. Canned air is an essential when cleaning out dust in small spaces. It doesn’t work for every task, but it’s essential enough that we always keep a can on hand. Cotton Pads are a good, soft, cleaning tool. You’ll spray these with the rubbing alcohol, or water, instead of spraying the liquid directly on the tech. 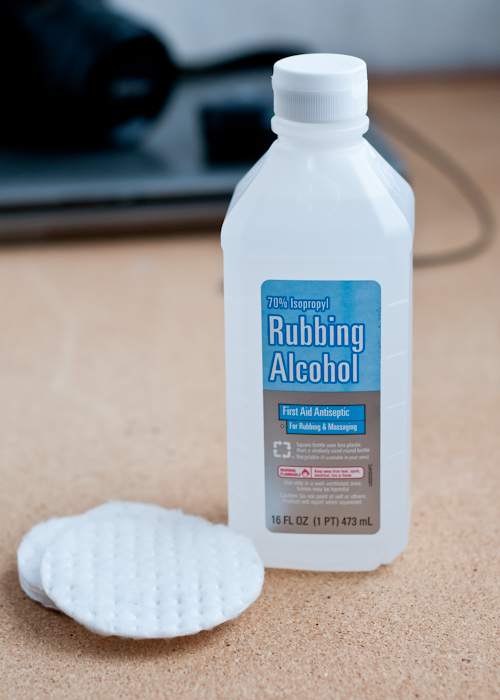 Rubbing Alcohol is another essential. But, there are certain items that should not be cleaned with rubbing alcohol. So keep reading. Microfiber Cloths are extra soft and won’t leave lint when you use them and also prevent scratches when you’re cleaning monitors and other screens. Soft Brushes, the kind you use for makeup, are probably my favorite tool for cleaning technology. It is essential for dusting and is very gentle, especially for cameras and keyboards. Tweezers are used for delicately grabbing flakes or dust bunnies that get lodged in crevices. Q-tips are good for gathering dust small places. 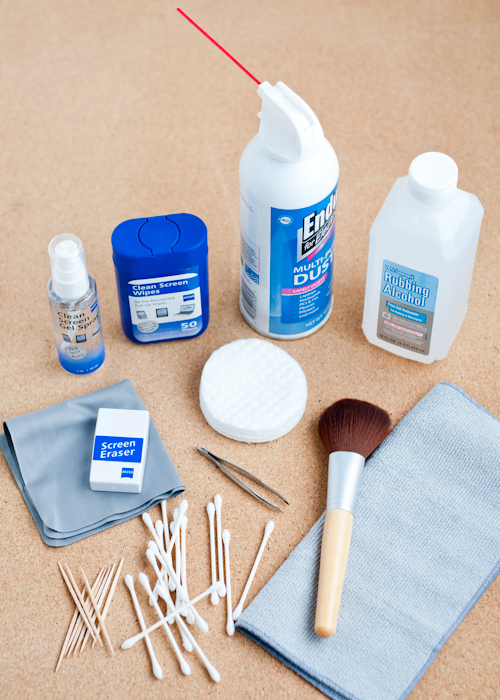 Toothpicks are great for scraping out small areas where grime can hide. Lint-free Lens Cloths are essential for making sure your cameras see clearly. Screen Erasers are fairly new-to-me, and they’re pretty handy! More on screen erasers below. 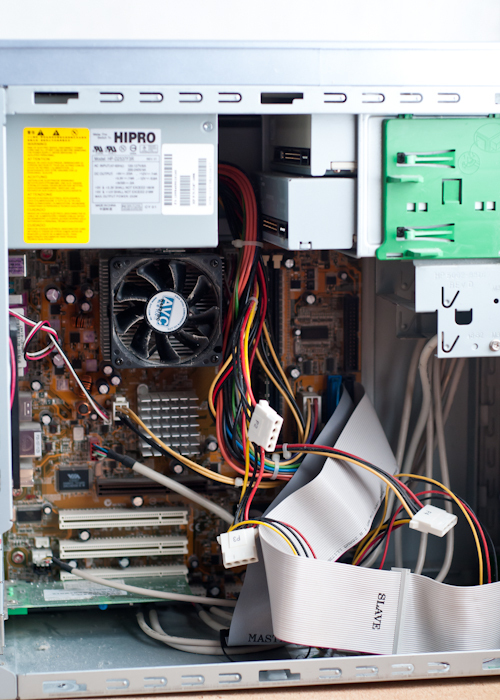 Now that you have your tools, its time for Secret #2: Before you start cleaning electronic devices, be sure to unplug them, or power them down, and let them cool. Read any warnings listed on the device itself or the packaging/directions if they are still around. If not, check the manufacturer website — sometimes if you open the case (like a cell phone or computer), you’ll void your warranty. If you don’t want to chance it, leave the deep cleaning and maintenance to a professional instead, and stick to a quick wipe down of outer surfaces. One of the most visible places for dirt, dust and grime is a screen — whether it’s a monitor, cell phone, LCD panel, or TV screen. Screens are easy to clean, but they are also an area that requires a little more TLC than you might think. This is definitely not the time to whip out your standard blue window cleaner and paper towels. Secret #3: Alcohol and ammonia can harm screen surfaces, so stick with the alcohol-free gel cleanser or the disposable wipes. If you can’t find a gentle cleaner or disposable wipes, use plain water and a lint-free cloth. A lens cloth, like the kind you use for eye glasses, is perfect for this task. Microfiber cloths work too. 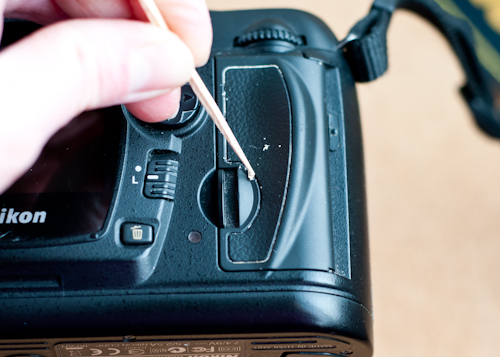 One more plug for using a special lens or screen spray: they often have antistatic properties that will repel dust. You’ll first want to brush away any dust you see before you start wiping it down. This will help prevent scratching. 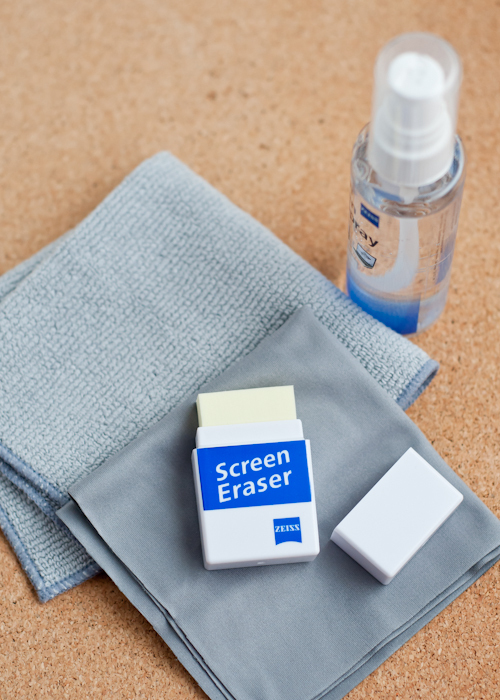 The screen eraser pictured here is another handy option. You just rub it in a circular pattern over the entire screen and it that’s it! I find it to be very effective. 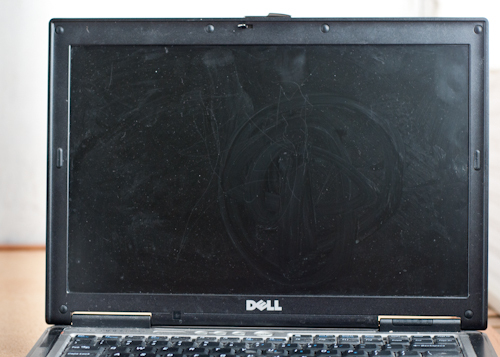 Computer and other screens should be cleaned on a regular basis, as needed. At our house this is approximately twice a week for our desktop computer, and much more frequently for our cell phones. In fact, I recently bought my first smartphone (I know, high five!) and I was amazed at how quickly the screen became dirty. To clean smartphone screens, I prefer to spray a little of the gel cleaner onto a microfiber cloth (NOT the screen itself) and wipe. 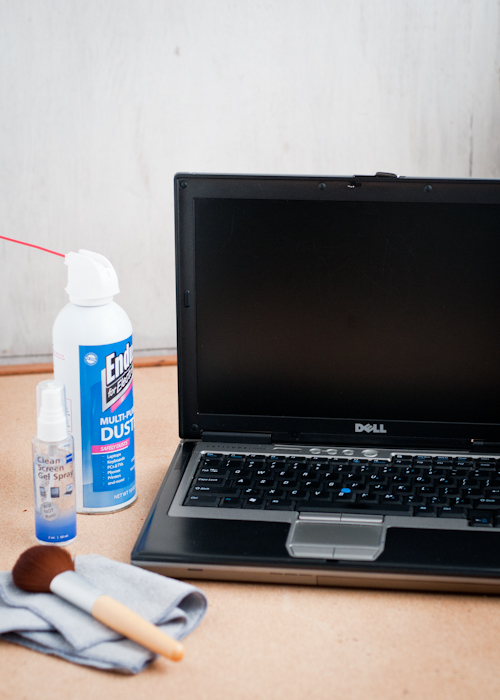 Secret #4: You never want to spray a cleaner directly on a monitor or screen because the overspray could get into cracks and crevices and cause damage. If you do get liquids where they aren’t supposed to be (this goes for keyboards and other parts of your devices), take your tech to a professional to be properly cleaned and dried out. If you have a scanner, the glass scanning surface should be cleaned in the same manner to prevent scratching. Start by turning the keyboard over and gently shaking it to loosen crumbs or bits of debris. Next, you might be tempted to vacuum your keyboard. I always thought this was perfect okay, but not so! Which brings us to Secret #5: Turns out vacuums can potentially create static electricity that can short out your keyboard. Oh dear! What you should use instead: A soft brush, like a large makeup brush, perfect for gently getting into tiny crevices. After a dusting with the brush, canned air should be your next step. Applying too much pressure with the canned air can leave a wet spot, so be careful — use short bursts of air from about 6 inches away. At this point, all crumbs and dust should be thoroughly banished. For remaining dirty spots on your keyboards, use a q-tip dipped in a small amount of rubbing alcohol mixed with water (about a 50/50 combo). Q-tips are the perfect size to move quickly in and out between the sets of keys on a full size keyboard. Just be aware not to get the q-tip too damp — excess moisture will wreak havoc on your keyboard. Secret #6: The exterior bodies of most desktop computers and laptops can be cleaned very nicely with rubbing alcohol. It works really well to remove dirt and grime, as well as any residue from adhesives or stickers. Use a diluted mix of half alcohol, half water, and apply it with cotton pads, or a lint-free cloth if you’re worried about the lint from the cotton. 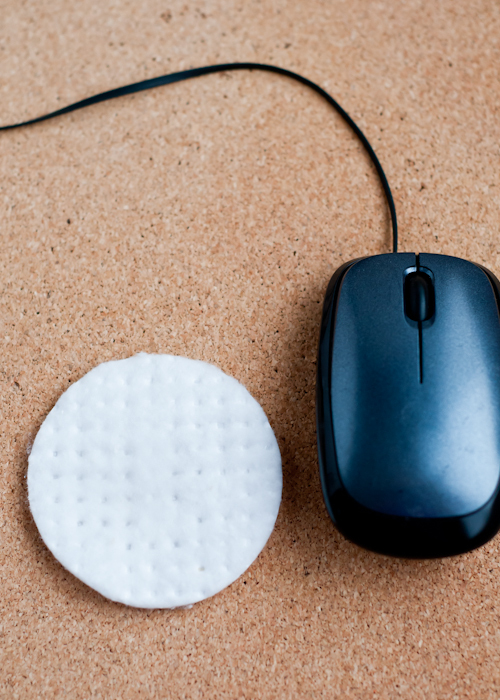 Depending on the kind of computer mouse you have, you might be able to take it apart and clean dust from the mechanical parts — for instance a roller. If it’s an optical mouse, simply wipe off the bottom with a cloth. 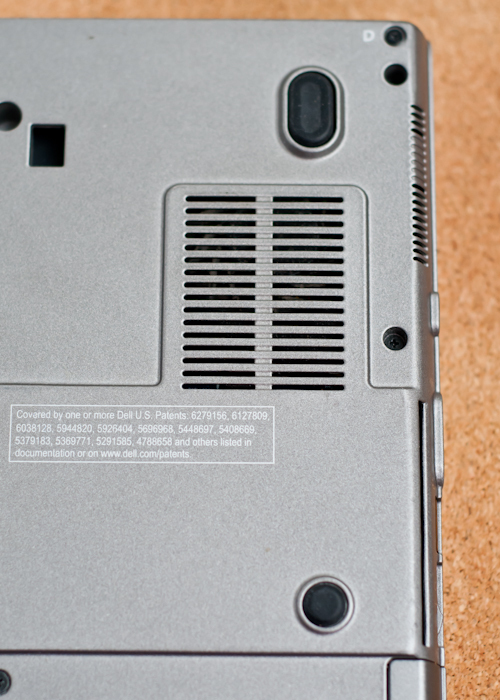 Some laptops have a removable battery that is perfectly fine to remove and dust as well. 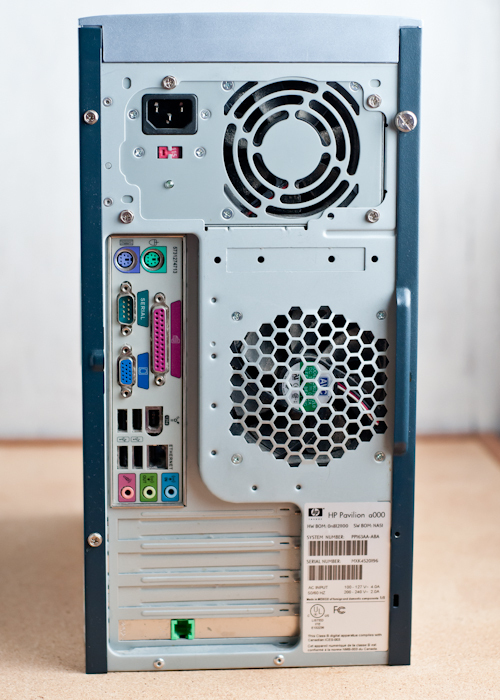 Most desktop computers and laptops have one or more cooling fans. 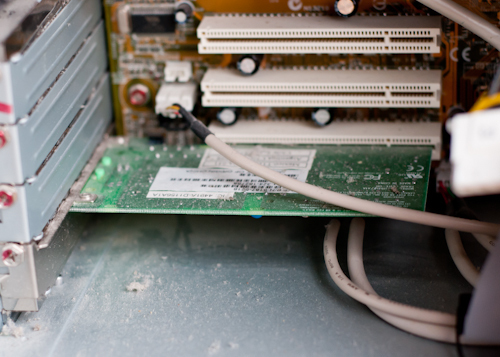 Secret #7: Cleaning these fans can really affect the performance of your device. 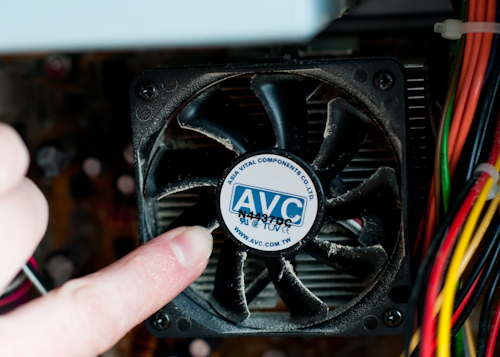 A dusty, dirty fan means it’s not effective in cooling. If it’s not cooling properly, then the computer might overheat and that’s definitely not a good thing. The fans can be dusted from inside and out. 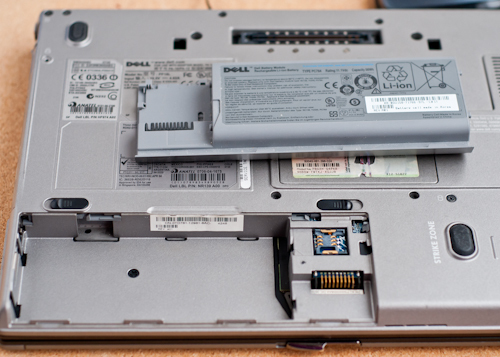 When it comes to laptops, it might be better leaving that to a professional as it is more complicated to take apart. CPUs are a little easier. (Again, be sure to check your warranty to make sure it’s okay to do this.) If you choose to remove the cover of the CPU, be sure it’s totally unplugged first. Also, using common sense, be careful not to unplug anything inside or remove any screws that you don’t need to remove. We feel comfortable enough cracking open our CPU to give it a quarterly dusting. If you live in a home with pets, or if your computer is in an area that accumulates a lot of dust, you’ll want to dust the inside and fans more often. Every 4-6 months is probably adequate enough. Again, don’t use a vacuum here, as tempting as it might be. 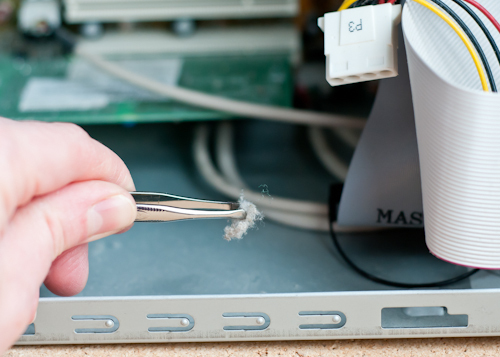 Once it’s open, start by removing larger dust bunnies with a pair of tweezers. Next, use canned air to give the interior a general dusting. Again, be sure to use short bursts of air from about 6 inches away. Next, concentrate on the fan — which might take a little extra effort. You can use a barely damp q-tip or cloth, in addition to the canned air. Secret #8: The fan will start to turn when the canned are is used. You don’t want the fan to turn too quickly or rapidly because it could cause damage to the fan. So hold it gently still with your finger while you clean. I own several DSLR cameras, but this same advice applies to point-and-shoot cameras. Secret #9: I don’t clean the inside of my cameras myself. The mirror inside is so delicate that it can easily scratch or be damaged. This is something to definitely leave up to the professionals. 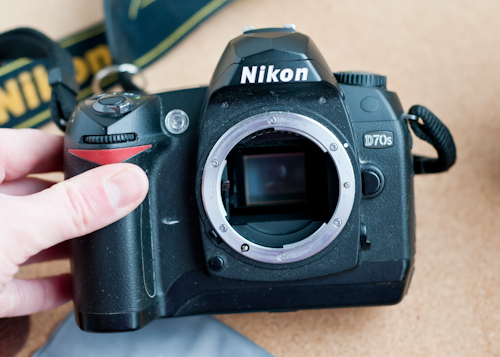 A yearly cleaning is probably sufficient unless your camera sees heavy use, or if you’ve taken a trip to the beach recently. The outside can be cleaned the same way as your computers — a microfiber cloth or cotton pad, dampened with a 50/50 alcohol water mixture. Or, you can rub it down with a lint-free cloth. After a general wipe down of the exterior, it’s time to look at the details. Cameras also have so many areas where dirt can collect. This is where toothpicks come in handy. Lenses require extra care too. 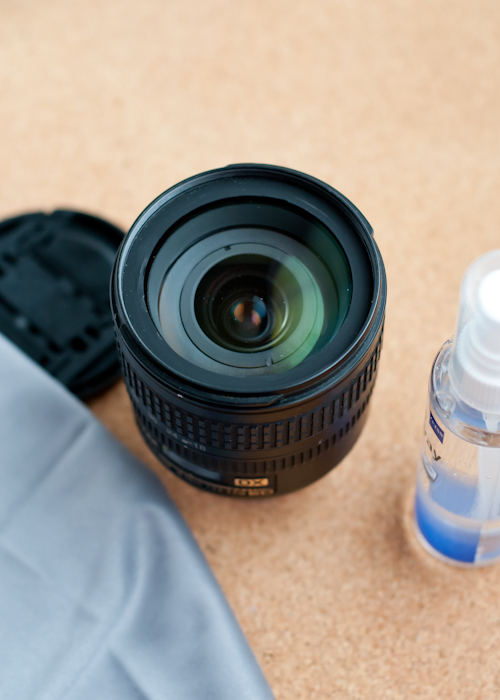 Secret #10: One rule to remember is that you should never wipe a dry lens. Breath on it or use a moistened microfiber cloth or a disposable lens wipe . The makeup brush is also useful here if there is a lot of dust. But note Secret #11: Don’t use canned air inside or outside your camera. 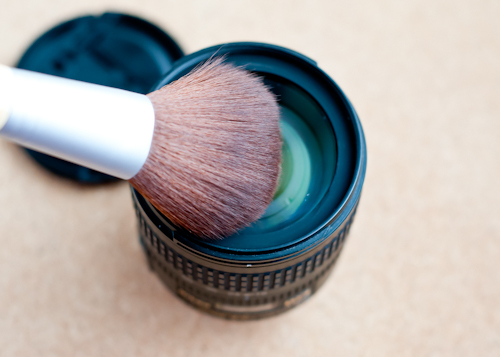 It’s better to use a soft brush (as pictured) or a special blower/brush combo that can be found at most camera stores. And that about wraps it up — we’ve covered the basics of keeping your electronic devices clean and dust-free. Happy dusting! And please share if you have your own secrets for keeping your tech clean and germ free. P.S. — Find out all the secrets! See the whole series here. Credits: Text and images by Lindsey Johnson for Design Mom. I’m always afraid I’m going to destroy an electronic device by using the wrong cleaning product on it, so thank you for this! Thank you, thank you, thank you for posting this!! I am saving this and cleaning my tech devices immediately!! ummmm ok his may be the best and useful post I have ever read. THANK YOU!!! I AM PARALYZED when I go to clean this stuff! I simultaneously believe this and refuse to because it’s awful. I am wiping down my phone and mouse right now! Exceedingly helpful! Thank you so much. I have a new iPad and it’s so easily smudged – of course! How can it not be with all the finger action! Awesome Post, Really Enjoyed it…. 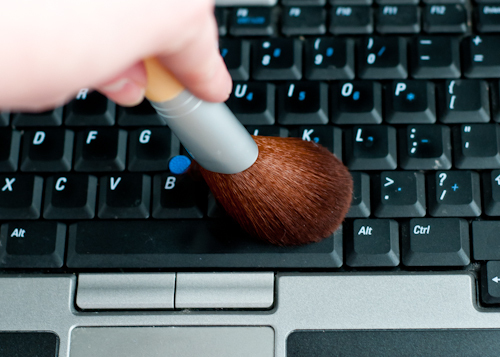 Clean paint brushes work well for cleaning in between keyboard keys, too! I’ve also used one of those super-soft cloths used for eyeglass wiping on my monitor and screens of devices. These are SUCH helpful tips! 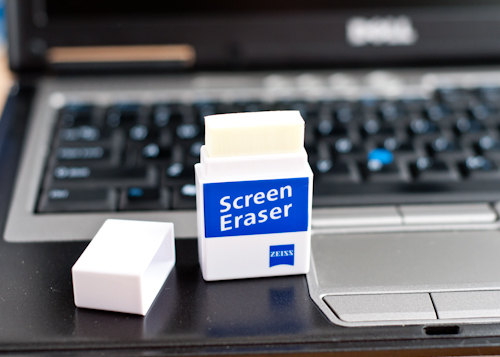 I had no idea a screen eraser was even a thing until now. Amazing! I have a neat trick that an IT guy taught me to clean a key board. Turn it upside down and tap it gently to make the crumbs fall: gravity is your best friend! Another trick i discovered by myslef on shared computers. I noticed that mine was dirtier quicker if someone else was using my keyboard . I do wash my hands very often. Clean your hands before working like I do and you mught end up much more happy. For screens , any screen ,I found that the optic polyfiber chamois , the big photo ones and the small ones , are the best. You can find expensive large ones at Photo places and…cheap, but really cute ones at japanese dollar store like Daiso. I always carry one in my pocket! 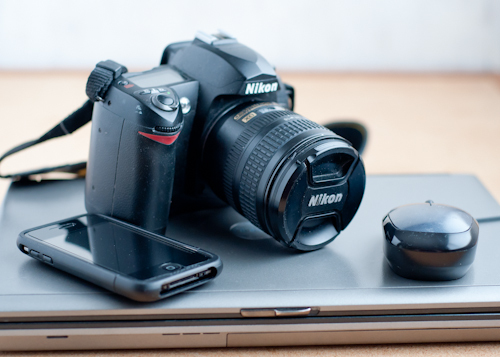 13 Ways To Clean Your Gadgets With Everyday Items - DIY - All in One!